What is hemp seed? What is it used for? The plant can reach a height of approximately 30 inches, and flowers during the summer. The seeds are harvested in autumn; they are pounded or powdered, and taken raw for use. Hemp seeds contain a fatty oil, and are a good source of many essential fatty acids. Hemp has a long history of medicinal use. In traditional Chinese medicine, hemp seed has sweet and mild properties, and is associated with the Spleen and Large Intestine channels. Traditionally, it is used as a laxative to loosen the bowels and relieve constipation. Many practitioners prescribe it to help relieve pain, induce sleep, and treat nausea associated with chemotherapy. It also has a soothing effect on some nervous disorders, such as multiple sclerosis, and has been used to relieve pressure in the eye caused by glaucoma. When treating constipation, hemp seed is often used with other herbs, such as rhubarb and magnolia bark. How much hemp seed should I take? The typical dosage of hemp seed is between 10 and 30 grams, used in a decoction. It is usually mashed or powdered before being added to water. Some practitioners also provide concentrated hemp seed extracts (in a 5:1 ratio); for extracts, the recommended dose is 2-3 grams per day. 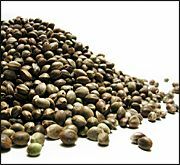 What forms of hemp seed are available? Because of hemp's narcotic effects, the sale of hemp seed and other parts of the plant has been banned in most Western countries. As a result, hemp seed is practically impossible to obtain without a doctor's prescription. What can happen if I take too much hemp seed? Are there any interactions I should be aware of? What precautions should I take? Hemp is a narcotic that can produce feelings of exhilaration, along with possible hallucinations. In the United States, it is illegal to possess hemp or hemp seed without a doctor's prescription. Ma AH, et al. Separation and quantity determination of fatty acids in 10 medicinal fruits. Journal of Shizhen Medicinal Material Research 1998;9(1):53. Wang BX (ed). Modern TCM Pharmacology. Tianjin Science and Technology Press, 1997. Ren HY, et al. Huo ma ren oil's effects in lowering cholesterol and counteracting atherosclerosis in the quail. Henan Journal of TCM 1998;18(5):294-295. Zhang MF, et al. Huo ma ren's analgesic, anti-inflammatory, and anti-thrombotic effects. Journal of Practical TCM 1999;13(1):13-15.